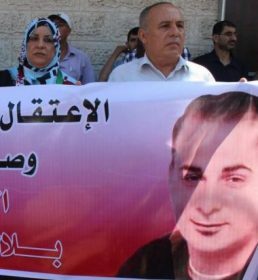 Physicians for Human Rights – Israel: Bilal Kayed, a 35-year-old Palestinian man from Nablus who is being detained by Israel has reached 43 days of hunger strike, and resolves to continue his protest until he is freed. Bilal was placed in administrative detention on 13 June 2016, when he was supposed to be released after completing a sentence of 14.5 years in an Israeli prison. In protest of his arbitrary detention without charge or trial and his continued placement in solitary confinement, he began his hunger strike on 15 June 2016. Bilal’s health has continuously deteriorated since he started his hunger strike and he is currently entering a very critical stage. He is suffering from deterioration in his vision and from difficulties to stand up or walk, with physicians warning of the possibility of a stroke. He is currently shackled to his hospital bed in Barzilai hospital. Bilal is also being denied access to an independent doctor’ visit. All of those practices violate medical ethics and his right to health and freedom from torture and/or cruel, inhuman or degrading treatment. On Friday 22 July 2016, Physicians for Human Rights – Israel appealed to the District Court of Beersheva to end the continued shackling of Bilal to his hospital bed. The shackling of a hospitalized prisoner violates medical ethics, international medical guidelines and Israeli Ministry of Health guidelines, as well as international human rights law. The medical staff has an ethical and professional obligation to demand his unshackling for the sake of his medical treatment and in order to maintain necessary trust in the patient-doctor relationship, which is pivotal for the patient’s well-being. The handcuffing of a prisoner who is undergoing treatment constitutes grave injury to their dignity, and in this case amounts to cruel and degrading treatment, in contravention of Israel’s legal obligations. Bilal’s shackling also violates the Israeli Prison Service (IPS) ordinance, which states that a prisoner should not be shackled while in hospital unless a real flight or security risk exists. The prisoner’s health condition must be taken into account and a written justification must be given. As has happened with other Palestinian hunger strikers, Bilal’s health condition was not taken into account and no justification was given for his shackling. Furthermore, PHRI has also requested Bilal’s access to an independent doctor and the IPS has rejected the request. Bilal’s treatment indicates that Israel’s political considerations are at play in preventing hunger strikes as a form of legitimate protest, and these practices operate in contravention of medical and humanitarian needs. Hunger striking is a non-violent form of protest, and often the only recourse for prisoners to draw attention to an issue. Palestinian prisoners go on hunger strikes to protest Israel’s arbitrary and abusive detention policies, whereby Palestinians face secret evidence before military tribunals and can be jailed for months or even years without facing formal charges or a trial via the use of administrative detention. As per Addameer’s numbers for May 2016, there are 715 Palestinians currently held in administrative detention by Israel, all held under secret evidence. Notably, in its 2016 concluding observations, the UN Committee Against Torture recommended that Israel, “urgently take the measures necessary to end the practice of administrative detention and ensure that all persons who are currently held in administrative detention are afforded all basic legal safeguards” (para. 23); and “guarantee that persons deprived of liberty who engage in hunger strikes are never subjected to ill-treatment or punished for engaging in a hunger strike, and are provided with necessary medical care in accordance with their wishes” (para. 27). We call on the international community to urge Israel to release Bilal Kayed immediately, to end the harsh, inhuman and degrading practices that pressure hunger strikers to end their strikes, and to review the continuous and systematic human rights violations of Palestinian prisoners and detainees, especially in regards to the policy of administrative detention.